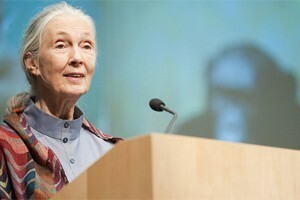 High profile animal advocates, Dr Jane Goodall and Michael Kirby AC join the animal think tank, Voiceless as patrons. Animal protection think tank Voiceless has announced the appointment of world-renowned primatologist and animal advocate Dr Jane Goodall, and former judge of the High Court of Australia, The Hon Michael Kirby AC CMG, as Patrons. The two join existing Voiceless Patrons, 2003 Nobel Laureate for Literature, J M Coetzee, and Voiceless co-founder and managing director Brian Sherman AM. Brian Sherman founded Voiceless in 2004 with Ondine Sherman who was named this week as one of Forbes Asia’s 48 Heroes of Philanthropy. Michael Kirby was appointed to the High Court of Australia in 1996, serving 13 years. In later years, he was Acting Chief Justice of Australia twice. When he retired from the High Court on 2 February 2009, Michael Kirby was Australia’s longest serving judge. In 2010, he was awarded the Gruber Justice Prize. Michael Kirby says he’s delighted to be joining Voiceless as Patron. He says through his association with Voiceless his eyes have been opened to the inhumane conditions in which hundreds of millions of factory farmed animals are confined. He says while people are at different stages on the issue of dietary choice, the community increasingly agrees that our fellow sentient beings, including those farmed for food, must be treated with compassion, and have the opportunity to live a decent life free from suffering. Michael Kirby’s appointment strengthens Voiceless’s pioneering work with the senior legal fraternity in animal protection, and in establishing animal law as a discipline in Australia. Dr Jane Goodall began studying chimpanzees in Tanzania in 1960. She observed chimpanzees using tools, a skill previously thought unique to humans. In 1977, she founded the Jane Goodall Institute for Wildlife Research, Education and Conservation. Today, Dr Goodall travels around the world 300 days a year speaking about the threats facing chimpanzees, other wildlife and the environment, and her conviction that it is not too late to turn things around if each and every one of us does our bit. Jane Goodall she has for decades been concerned about factory farming, in part because of the tremendous harm inflicted on the environment, but also because of the shocking ongoing cruelty perpetuated on millions of sentient beings. She says she shares Voiceless’s belief in the importance of encouraging children to develop their intuitive understanding of our kinship with other animals, and look sforward to the opportunity for her Institute to work more closely with Voiceless on a number of educational programmes. She says that she believes that once people understand what is involved in factory farming they will think twice about eating meat from those tortured beings. Voiceless co-founder Brian Sherman csays he wholeheartedly welcomes their new Patrons ’ exceptional intellects, their advice and ideas, and their conviction, shared with Voiceless, that they have a moral and ethical obligation to defend the interests of sentient beings, of other species who have no voice.